I would like to introduce you to Graysen. 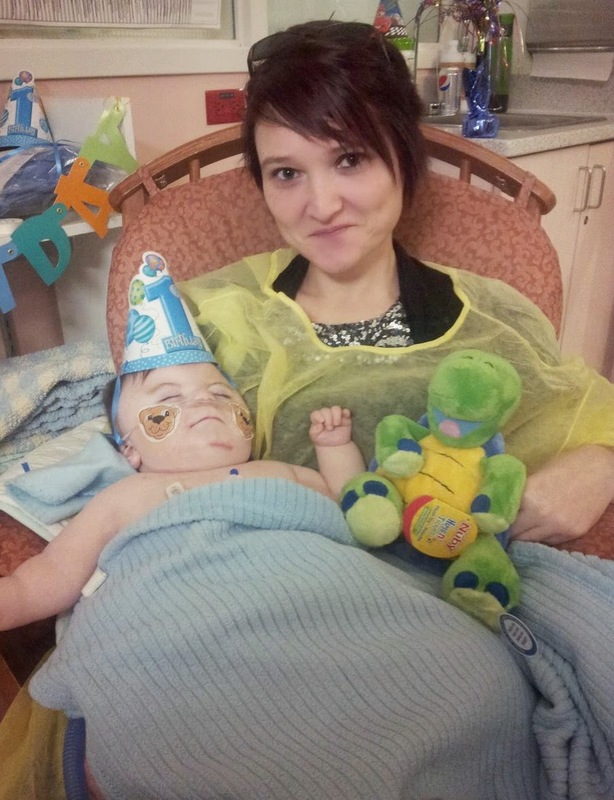 At only seventeen months old, he has been through more in his short life than many will face in a lifetime. His mom, Alice shares his incredible story. When I found out we were expecting our fourth child, I was over the moon. After having a miscarriage that nearly took my life in December of 2010, I knew deep down that I should try again, and after having three beautiful girls, I longed for a boy. My husband Steve worked in Wabush, Labrador, on rotations of five weeks away and two weeks home. At nineteen weeks, we went to our first ultrasound, so anxious and excited to catch a glimpse of the little miracle growing inside me. The ultrasound tech seemed to be taking forever and made no attempt to engage in conversation. I just assumed that she was having trouble catching the images she needed, and I figured that before long we would be on our merry way with a few pictures I could show off to our family and friends. A doctor was called in and looked at the images for a long time as well, until I finally asked "Is there anything wrong?" She turned to me and said, "Is your husband here with you?" In an instant my whole world turned upside down. I was told that my baby had some complications and we were referred to genetics immediately. The very next day, Steve and I met with a genetics councillor and were told that the ultrasound findings compared to those of a child with Down syndrome or a chromosomal issue with chromosome 18, which could be fatal. I was told that if I was able to carry our baby to term, he may only last a few days, or a few weeks but we certainly would not celebrate his first birthday. I was numb. We then went to the maternal fetal assessment unit where I had an amniocentesis. After the procedure, we met with social workers and psychiatrists to decide "what we were going to do" about the situation. I remember sitting in the office, my head still spinning from the emotional roller coaster I'd been thrown on just the day before, and I remember looking up at the doctors through swollen eyes, saying "What on earth are you talking about?" I was answered with "We believe, Mrs. Power, it is in your best interest to terminate this pregnancy." Being a person who is very in tune with my faith, I decided that I wasn't going to do anything about anything. If God decided he wanted to do something about this, that was entirely up to Him! So we continued to have ultrasounds week after week for the next 17 weeks. Some weeks were terrible, finding new complications. Other weeks seemed a little more positive. Then finally, the results came back from the amnio. It was not Down syndrome or the chromosome 18 issue, but we were still unsure exactly what was going on inside. On October 3rd, 2012, I called my long time friend Jackie at 3:30 in the morning, telling her it was time, and that I needed her to be my "stand in", as Steve was not due home for another couple of weeks. After a quick labor, at 11:43am weighing in at 5 lbs, 9 oz, I was blessed with my baby boy, Graysen Thomas Power! 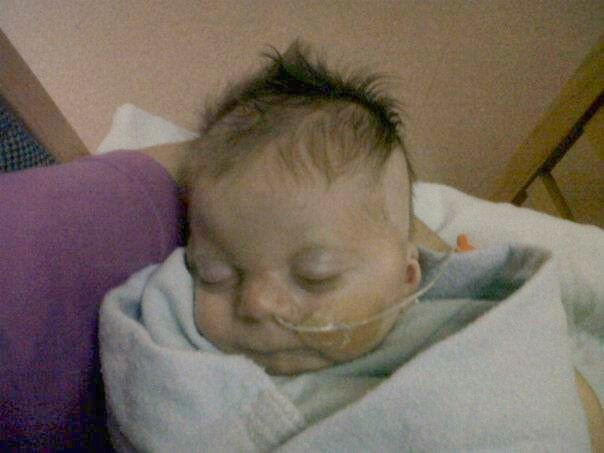 Before I could even get a look at him, they whisked him off to the NICU. Lying there, still shaking from the adrenaline rush of just giving birth, I managed to catch a glimpse of his hair as he was rushed out the door. I waited in the delivery room to find out what was going on with my baby. After about forty minutes, one of the doctors from NICU came in to explain what was happening. He started by saying that they were just getting Graysen settled away in NICU and that I'd be able to come see him momentarily. All I could think was, "Why is he not coming back to me?" Every half an hour someone would come in to say that it should only be a little longer. Finally, just before 3:00pm I was brought over to the NICU. I was so nervous, yet excited all at the same time. I honestly don't remember much of that day, just the confusion. They wheeled me into a little room with an incubator and doctors and nurses all around. I looked in with the hopes of finally getting to meet my son. The numbness in the pit of my stomach had returned, dispersing itself to every inch of my body, quickly and evenly. I pictured seeing a sweet little angelic face looking up at me but all I saw were tubes, wires and IV's coming out of everywhere! His nurse handed me something. It was a little piece of folded paper containing his very first haircut. They were only able to get an IV in through his scalp, and had to shave a little patch to do so. I was so numb. I know now that I should have been in tears, but none would come. I just sat and stared. After a few minutes, I guess the nurse sensed that I was not handling the situation well so she told me to head back upstairs and get some rest. I was given a pamphlet about the NICU with the phone numbers and I was told that I could come down or call at any time. Back up in my room, I had planned on getting some rest, but instead I just lay there like a zombie. I called down to the unit and checked in every so often. The nurses came to check on me frequently, and brought in the breast pump every three hours. I was a stranger in my own body, just going through the motions. 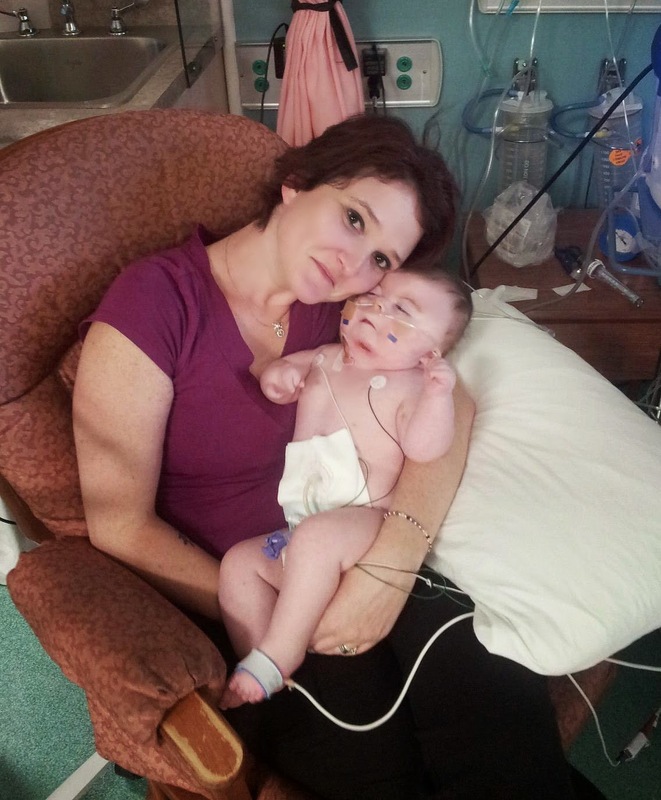 The very next day they were able to remove Graysen's breathing tube, but he still needed a little bit of support. He was put on a CPAP machine, and blood tests were ordered. After a full week of sitting by his incubator, I was finally able to hold my son. The whirlwind had only just begun. I met numerous doctors, specialists, nurses, and other parents who were at the hospital with their own little ones. Then one day, I came into the unit I noticed that one of the incubators was missing and a rocking chair was there in it's place. I said to the nurse how lovely it must be that that baby was able to go home. She looked at me and just smiled. Later that afternoon, a Mom came in to retrieve a few sentimental items. She gave the nurses a hug and thanked them for everything. One nurse said that she wished they could have done more, and it was then that I realized the truth behind the missing incubator. I was awakened to a whole new level of seriousness. Babies really do die in this world, and mine could too. Things were chugging along and we eventually moved down the hall to what was considered level 2, for the "not so serious" cases. We were one step closer to the doorway, and that much closer to going home! A few days later, I attempted breastfeeding Graysen, but it did not go well. He would get overcome, his oxygen saturation would dip and he would go off colour. He just didn't do well with it at all. I thought then what a failure I was. I was able to breastfeed all three of my girls, why not now? What kind of a mother can't even breastfeed her child? It was then discovered that Graysen also had a cleft pallet. It wasn't me after all. So I continued to pump every three hours, as I thought at this point that was all I could do for my fragile son. We tried the special cleft pallet bottles and he would do okay with those, drinking small amounts at a time. The rest would go through his NG tube. After a few weeks, Graysen started having spells where his oxygen saturation would plummet to the low 50's and he would actually turn blue. They would give him some free flow oxygen and he would come back around. The doctors in NICU consulted ENT (yet another specialist to add to our growing list). The ENT doctor took a look down with a scope and discovered that Graysen had laryngomalacia, which is a floppiness of the "flap" that covers the windpipe while you swallow. We discovered that when Graysen would lie down, his flap would completely cover his windpipe and almost shut off his breathing. There was also a threat that with his severe reflux, he might aspirate. We began new medications for reflux, hoping it would settle things down. His reflux continued and I was told that he would need to have a procedure called laryngoplasty where the ENT would reduce the size of the flap in the hopes that these blue spells would stop. He had that surgery on the 3rd of December. After the surgery, his doctor came out and explained that there was more to the procedure than he had anticipated. There was going to be a lot of swelling, and I could expect Graysen to be on a breathing tube until the swelling went down. It seemed like years before I was able to hold him again. Before I knew it, Christmas was upon us. A few days before Christmas, I received a phone call from genetics to confirm that our test results were in. Graysen was diagnosed with Cornelia de Lange Syndrome. Within this rare genetic syndrome there are mental as well as physical delays. Extremely low muscle tone, reflux, heart defects, limb abnormalities, kidney issues, cleft pallet, and the list goes on and on. Graysen has all of these symptoms, as well as Chronic Lung Disease. As the weeks went by, I was missing Steve more and more. Dealing with all of these new findings was one thing, but dealing with them alone is a whole other issue. Finally Steve came home, and thinking he would help me deal with our new life, it actually made me feel worse. It was then that I realized how much I had actually taken in over the last little while. It was just before the New Year when Graysen's oxygen requirements sky rocketed. Still in the NICU, he had aspirated into his lungs and ended up with pneumonia. I received a phone call from the hospital saying that they were bringing him to the O.R. They had tried relentlessly to get an IV into him, but were having no luck whatsoever. They asked me to come in because they told me that without this much needed IV, they couldn't be sure how the night would go. Myself and Steve went in that night to potentially say our goodbyes. Thankfully, they were able to get the IV in and we got past that obstacle, but it was only one of many more to come. Graysen recovered from the pneumonia and things were looking up. 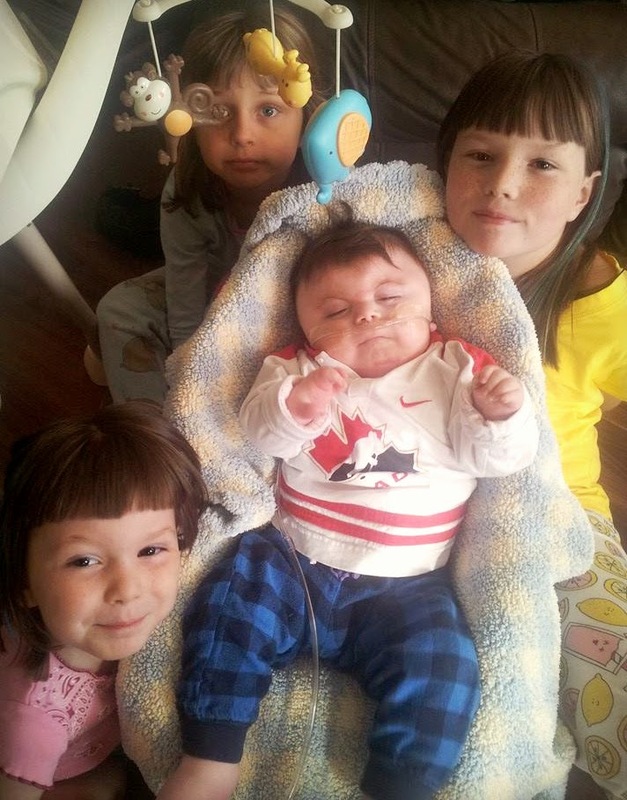 They had decided that Graysen had outgrown the NICU and that it was time to move on. He was still on a high flow of oxygen and I was told that if he stayed on this flow, he would have to go to PICU. I was devastated because I had thought that if we were leaving the NICU, we would be coming home. That was not the case. A meeting was planned with the numerous doctors and specialists that would be involved with Graysen long-term. We were brought to a conference room at the Janeway and as we were coming in, there were people coming out looking for more chairs. The room was full of people, and it was then that I realized just how many areas of Graysen's life was affected. I sat and listened as they threw ideas around the table and spoke about all of the things that Graysen would not do. We spoke about the G-tube surgery which he was to have as soon as he reached 5kg. For the first time in my life I wished he wouldn't get any bigger. After the pneumonia scare and once he was able to start feeding again, they placed an NJ tube that bypassed his stomach and sat in his small intestine. In doing this, he had to begin continuous feeds as bolus feeds were not an option. I knew that a G-tube would be the best for him so I sucked it up and decided to proceed with the surgery. At the time it just seemed so final. My son would never eat. The only "normal" thing I thought he might do was taken from me. We moved up to J4 Medicine on the 24th of January, 2013 and started a new chapter in our lives. We waited for Graysen to get to the 5kg mark, which he was creeping up on. 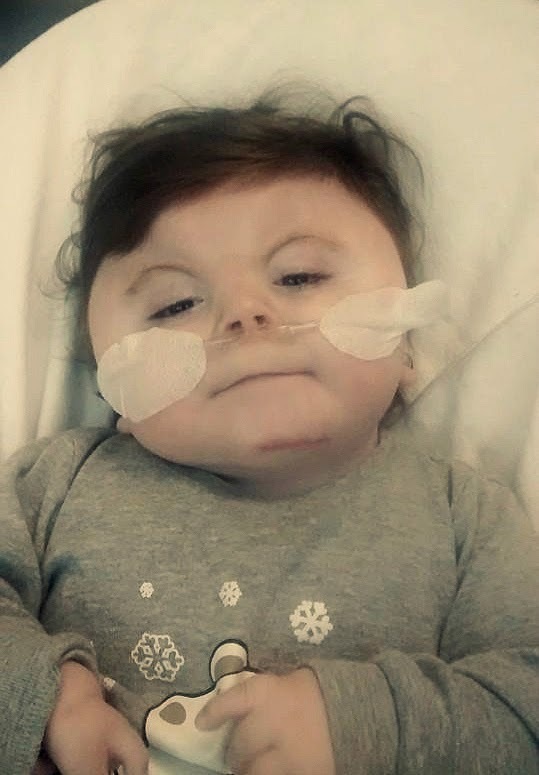 On the 12th of February, Graysen had his G-tube and fundiplication surgery. Things went well and finally on the 21st of March we came home for the very first time! Things were great, I was falling into a daily routine and was finally feeling the happiness a Mom was supposed to feel. Life was wonderful!! On the 25th of May I brought him back to the hospital with what I thought was just a head cold. His oxygen requirements had gone up and he was working a little harder to breathe. On the 29th of May, things changed. Graysen was having a lot of trouble breathing and at 1:00am he went into full pulmonary distress. He was foaming at the mouth, his chest and belly were bouncing, and he was turning blue. He was actively dying in front of me. I was asked to leave the room as the growing number of staff arrived, and doctors rushed in. Then at around 2am, Graysen was rushed to PICU to have a breathing tube inserted. With his syndrome, it was well known that Graysen's airway was obstructed so an easy intubation, and in this sort of urgency was completely out of the question. I could not comprehend what was going on. I was brought down to the PICU waiting room at 3am and the doctors that had been with us upstairs on the medicine floor as well as one that had been called in came out and explained that things were not going well. They told me that it was quite possible that Graysen's heart would stop and he may not be able to be revived in his current situation. I sat there nodding my head, although I wasn't hearing one single word. All I could hear was my own heart pounding, echoing throughout my body. I sat in the PICU waiting room until 6am, when they asked if I wanted to see him. I went in and all of a sudden I wished I hadn't. Graysen was hooked up to everything imaginable. I couldn't even really see him through all of the machinery. 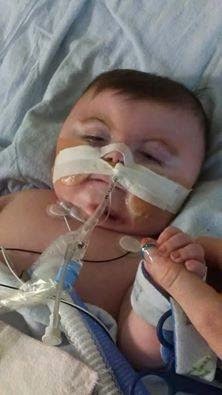 I was told to call my husband to come home from Wabush as soon as possible, and that they would try to keep Graysen alive long enough for us to say our final goodbyes. I called Steve and he made arrangements to get home as soon as he could. I was so sick. I'm not even really quite sure what happened after that, but I do remember going back up to Graysen's room on the 4th floor that we had so hastily left earlier that morning. I stayed up there for a little while, having called my family and telling them the situation. Sister Mary Molloy then arrived and we sat and we prayed. I had been praying the whole morning, long before Sister Mary had arrived. I had prayed to my father who had passed away in February of 2013, and begged and pleaded with him not to take my little boy. Sister Mary asked if I would like to go down to Graysen's bedside and pray together there. I was hesitant but I knew that's where I should be at that moment. We arrived downstairs and walked in on something I hope to never see again as long as I live. They had changed Graysen to an oscillator, which was a step up from the conventional ventilator. It keeps the lungs inflated and sends little juts of air to the alveoli to keep them open. In doing this, it causes his entire body to shake. I could not bare to see it, so I left and returned to the room upstairs. My brother Vince then arrived to sit with me and tried to keep my mind off of things until Steve got there. Sister Mary then returned to the room and sat with us for a while. She had asked me to please lie down for a while and Vince said that was a very good idea and he would be there to wake me if anything changed. I must have fallen asleep because the next thing I knew, it was 4pm and Dr. Barter from PICU and Dr. Jenny had come into the room. My heart sank. I knew that if they were leaving PICU things were not good. They came in and sat down. They introduced themselves to my brother and began to explain the situation. Dr. Barter, whom I admire deeply, was calm. She explained that things had somewhat taken a turn in the right direction. We were nowhere near being out of the woods but we were on the right path. The next thing I knew I was screeching. I knew what had happened, my guardian angel was working his magic!! Steve finally arrived at 6pm and we began the roller coaster ride of a lifetime. Graysen stayed on the oscillator for 3 weeks. He had been switched over to his belly on two separate occasions in the hopes of getting blood flow to different areas of his lungs. I was reminded that it was not a great thing to still be on this type of support, but again, not the end of the world. Finally one day, the phone rang in the PICU's family room where I had been spending the past 21 sleepless nights. I jumped out of bed to answer it and it was one of the nurses calling in from the unit saying that Dr. Barter and his nurse from the night before wanted to come in and speak with me. The blood drained from my face and the life quickly left my body. I answered the door and was confused by the fact that they were both smiling. Dr. Barter explained to me that at some point Graysen decided he didn't need the oscillator anymore and was now on the conventional ventilator. "He's awake and he's beautiful!". I sat there and stared at them both. They laughed and said "Yes, Mom, this is really happening". I rushed out of the room without even getting dressed. I looked down at Graysen, and into the bluest of blue eyes. I had forgotten how handsome he was! He was still on a lot of medication but he was awake and he was comfortable! The next ten days were a little up and down, trying to wean pressures and amounts and medications and having to be re-intubated at one point because he wasn't quite as ready as we thought he was. Finally, with the help of a brilliant device called NIV-NAVA, his breathing tube came out. He was a new baby. I was able to hold him for the first time in over a month and then a few weeks later, on the 11th of July, we came home. We've had four other PICU stays since that dreadful day in May. Graysen needed to be intubated for three of the four stays, the most recent in December he needed only the high flow oxygen. Does this mean he's growing out of it? I'd love to think so. Because of Graysen's Chronic Lung Disease, and the fact that his syndrome makes everything on the inside as well as the outside small (his airway for example), we will have more PICU visits. But I am used to that now. It's part of Graysen's life, so it is part of my life. On December 17th, 2013 there was another meeting that all of Graysen's doctors and specialists attended. Even with a room full of experts, no one could come to a conclusion as to why Graysen is the way he is, or why his lungs do what they do. We decided to go to Toronto's Hospital for Sick Children in the hopes that a new set of eyes may come up with something. (And I just have to say that not for one minute was it because of the fact that the doctors at the Janeway couldn't figure it out. It's just because Graysen's secret is a little harder to uncover). We travelled to Toronto on the 11th of January. After multiple tests, it was determined that Graysen has severe sleep apnea. You or I can have up to 5 apneic episodes a night and that is considered normal. Graysen has over 70! They decided to try him on a BI-PAP machine. The BI-PAP is a triangular mask which would give him pressure to keep his airway open and ideally would stop the apnea completely. After just 4 hours, Graysen's skin had a reaction to the mask where a green triangle was burned onto his face. We then realized that BI-PAP was not going to be an option and a skin biopsy was sent off, as there was concern that there may be another rare genetic syndrome that had not been uncovered. It is now thought that Graysen might require a tracheotomy. I have to admit that I am not looking forward to that at all. It is a road I never thought I would travel, but I've come to the conclusion that it's not about what I am comfortable with, it's about what is best for my son. I need to put my fears aside and accept our fate with open arms. All in all, we are surviving. Sometimes I wonder how the heck I've come so far, other days I cry myself to sleep. I have good days, I have great days and I have down right terrible days. I feel that sometimes I'm still mourning the loss of a "normal" child (whatever that is!) but realistically, I wouldn't change a thing. Graysen is Graysen for a reason. He was given to me so that I would become a better person. I know that I have changed. I have grown both spiritually and emotionally. He makes me so thankful for each new day. I'm always so curious as to what he will teach me, as I've learned so much from him already. When I feel like crawling back into bed and crying my heart out, he is my inspiration to jump up and seize the day! For all that he has been through and to still be here, growing more and more each day, learning, and all the while teaching others. He is my everything! I often find myself wondering what time will bring. How will things be when he's older? What kind of a future can I expect? Right now, I'm okay just knowing that he will have one. Alice, thank you for sharing your sweet boy with us! You have certainly been through a lot in such a short time, but you have a tremendous amount of love and support around your family. You're right.. sometimes it can be scary to think of what the future might hold, but if you take it day by day, or moment by moment, it is easier to appreciate all of the wonderful things that life has to offer. Enjoy your beautiful baby boy! He is a blessing!